Immerse yourself in the beauty of Akaroa and the wider south island. Akaroa, a unique place in the world, was born of Volcanic Fire and soothed by the gentle caress of the Pacific Ocean. Subtly defined by the Maori, French and European influences of it's settlers, Akaroa epitomises classic New Zealand beauty with a twist of historical significance. Just 75 kilometres from the city of Christchurch, New Zealand, Akaroa is a historic French and British settlement nestled in the heart of an ancient volcano. Explore the village with its colonial architecture, galleries, craft stores, and cafés. Relax or take part in the many activities that are on offer. Explore the dramatic outer bays and take your time to soak in the magic of this area. A wide range of accommodation is available and you will need more than a day to explore this little piece of paradise. 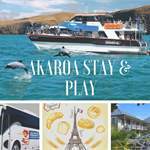 Akaroa and the wider area have a large number of exciting and unique experiences to offer our visitors. From Volcanic harbour nature cruises, to land based wildlife tours. A wide range of options to suit all Budgets. Choose one and enjoy your holiday from your holiday.